Paperless Pipeline’s permissions system gives admins full control over actions users can perform. Admins can grant permissions based on each user’s job-specific responsibilities. This article provides step-by-step instruction on how to grant and revoke user permissions. From the Manage Users page, search for the user's email address or name. Click the [Gear] then select "Edit User". Download Company-Wide Backups: Paperless Pipeline generates optional monthly backups. These backups are organized by property address and include all transactions (company-wide) that were created, closed, or expired during the previous month. Once generated, these monthly backups are available on the left-hand side of the Dashboard. This is the only account-wide permission, so it's not set by location. It should only be granted to Transaction Coordinators and other admin users. Create transactions: Allows users to create a transactions but not make any changes to them once the transactions have been created. Upload documents: Allows users to directly upload documents or email them to their maildrop addresses. Assign docs to transactions: Allows users to assign their own unassigned documents to transactions they can see. If a user assigns a document to a transaction, they can also break apart or merge that document. This permission, when combined with the View all transactions permission, allows users to assign any user's unassigned documents to any transaction in a location. Assign checklist templates to transactions: Allows users to assign checklist templates to transactions they can see. This permission does not allow users to check off items or change checklist tasks or due dates. Change listing/selling agents of own transaction: Allows users to add or remove other agents on their transactions (i.e. transactions on which they are assigned as listing or selling agents). Does not allow users to remove themselves from transactions. Change transaction status: Allows users to change the transaction status, close date, and automatic expiration date on their transactions. This permission is typically granted to admins but may be given to agents depending on your workflow. Add checklists to transactions: Allows non-admin users to add checklists to a transaction they’re involved with. You can grant additional permissions to your admin users. Here is an overview of what each permission does. If you have questions about any of these permissions, please email us at help@paperlesspipeline.com. View all transactions for this location: Allows users to view all transactions for this location whether or not they’re directly involved. This permission should only be granted to admins and never to agents since it grants them access to every agent's transactions. Delete any docs in this location: Allows users to delete any unassigned docs as well as transaction docs in a location. This permission should only be granted to admins and never to agents since it allows deletion of data and grants them access to every agent's docs. This permission is not needed for users to delete their own unassigned docs. It is also not needed to delete their own docs in their transactions as long as such docs have not yet been marked as reviewed. Reviewed docs can only be deleted by users with this permission. Review docs: Allows users to mark as reviewed any transaction docs in a location. This permission should only be granted to admin users and never to agents since it grants them access to every agent's documents in a location. When you grant this permission to your admins we strongly recommend you also give them the View all transactions permission so that they have full access to the transactions whose docs they are reviewing. Change doc status: Allows users to change the status of a document once it has been assigned to a transaction. Mark docs as entered: Entered docs is a feature to keep track of which docs have been entered into your accounting system. It can be enabled or disabled in Admin. This permission allows users to mark documents as entered from the Unreviewed tab. The category you assign to a document determines who has permission to view the file. You won't set it on this page, but it's important to keep in mind if you'd like to make a user "office staff". Fully manage checklists and templates: Allows user to manage all aspects of a checklist such as: manage checklist templates, check-off, edit or delete checklist tasks, change due dates on tasks, and assign checklist templates to transactions. Create users and locations: Allows users to create and edit users and locations. After you've completed their profile, their login information will be emailed to them. 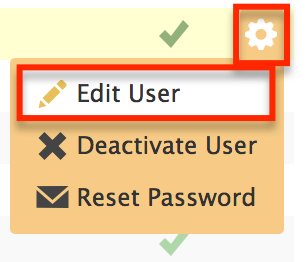 Users can also be designated as a master admin. This will give them all permissions in all locations, including the ability to update billing information, change an office’s monthly plan, and delete transactions. In this Pipeline Pro webinar, learn the various options available on your Personal Profile and learn how hard they work for you.